O “V” Palavra continua sua celebração VeganMoFo, o mês de comida Vegan, com a outra 25 letras do alfabeto. “S” é para abóbora picante Penne com Soy Feta e Avelãs. 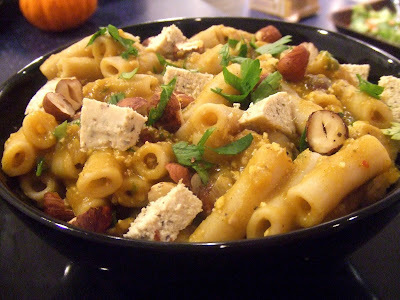 Here is another dish that should be on your Thanksgiving menu especially if you are having dinner with pre-vegans! This will get rid of all those ideas that Vegan food is bland, boring and always means salad or tofu (even though salad and tofu can be anything but bland or boring). Em primeiro lugar, everyone loves pasta (e se não o fizerem, they should). 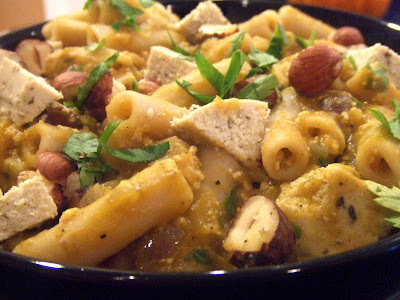 I used brown rice penne to keep the dish gluten-free but you could use whatever pasta rocks your Mayflower. A hearty pasta works best here to hold up to the sauce and other ingredients. Speaking of other ingredients, this pasta dish has VEGAN FETA CHEESE. Está certo, Vegan feta. 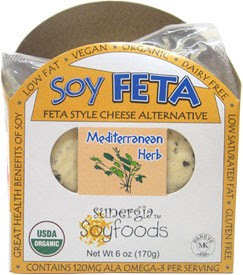 Claro, you could make your own but Sunergia Soyfoods makes a delicious Vegan feta cheese and in 3 diferentes sabores. I prefer the Meditteranean Herb, eu mesmo. They also make Vegan Bleu Cheese. It’s funny – before I was Vegan, I hated feta cheese. I never liked the salty, tangy flavor and would pick it off any of my food it dared to touch. But I love Vegan feta. It is much less salty but still has that tangy taste. It crumbles well and when you put it into the hot pasta sauce, it melts a bit and becomes like a ricotta going through the dish. Yum! Assim, second of all, for the all those people who “can’t live without cheese,” show them they don’t have to. 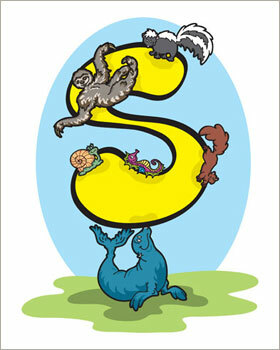 They can have cheese AND be cruelty-free. So there! Terceiro, avelãs! Talk about fancy-schmancy. Hazelnuts have such a great flavor and they add some crunchy texture to the otherwise silky sauce. Hazelnuts are very autumny and holiday-ish (sim, those are words). Very impressive! And finally, abóbora. You have to have something pumpkin for the holidays. Everyone expects pumpkin soups and pies. Surprise them by putting the pumpkin in the pasta. It makes a rich, creamy sauce and without any added cream so it’s figure-friendly. Olá, under the new Vigilantes do Peso Points Plus program (cue Jennifer Hudson singing), pumpkin has 0 points! That means you can eat even more pasta…Eu acho que. Portanto, você tem que – all the reasons you just have to serve this dish for your Thanksgiving extravaganza. É delicioso, it’s easy to make (especially if you use canned pumpkin) and it will knock the pilgrim boots off your guests. Pré-aqueça o forno a 375 graus. Cut the pumpkin in half and scrape out the seeds. Place the pumpkin halves, skin side up, on a baking sheet. Roast pumpkin until the flesh is lightly browned and soft. Cool for 15 minutes or until you can handle it. Scrape the flesh from the pumpkin, place in a food processor and puree until smooth. Cook the penne in a large pot of salted boiling water according to package directions. 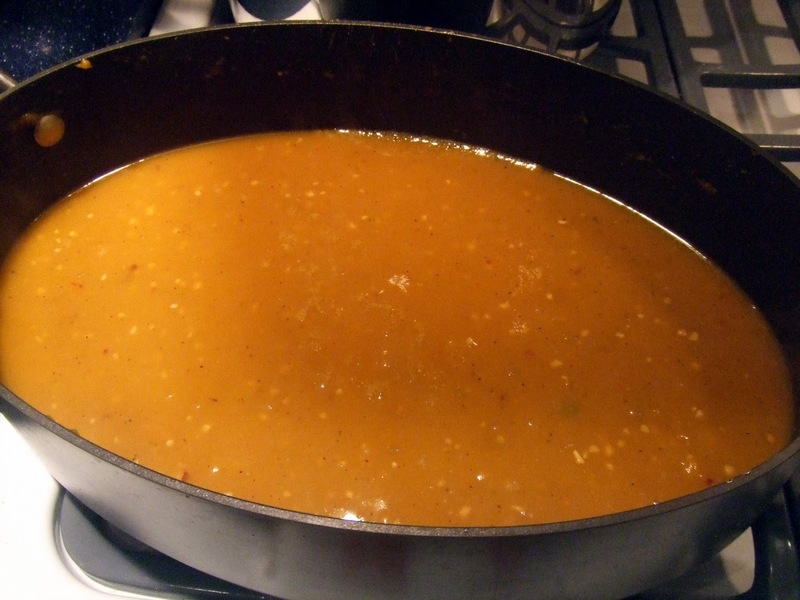 Reserve up to ½ cup of the starchy cooking water in case you need to loosen the sauce later. Melt the butter in a large saucepan over medium heat. Let the butter get slightly brown and nutty, sobre 3 atas. Add the shallots and garlic and sauté about 2 atas. Do not let them burn. Add the red pepper flakes and 1 Tbs. of the fresh sage (ou 1 TSP. sálvia seca). Cook for another minute. Stir in the pumpkin puree. Whisk in the broth until you have a looser sauce. Tempere com sal e pimenta. 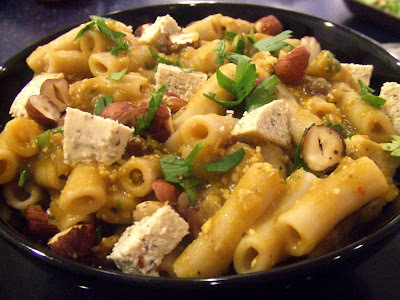 Toss the penne with the remaining sage, most of the soy feta and hazelnuts (reserve some of each for garnish). Add the parsley to the penne. 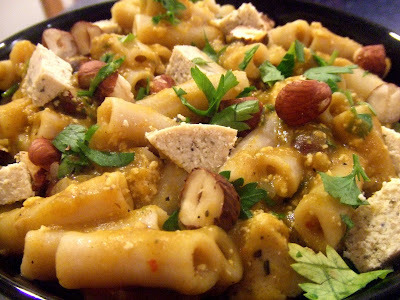 Se o molho estiver muito grosso, add some of the reserved starchy cooking water to loosen it. I didn’t need any when I made it. Garnish with the remaining soy feta and hazelnuts. Sirva ainda quente. Desfrutar! “S” é para abóbora picante Penne com Soy Feta e Avelãs. Por outro “S” palavras, confira o meu Spicy Chile Cheese Corn Muffins, meu Spinach-Stuffed Seitan Roast, meu Spinach Artichoke Dip, meu Sweet N’Spicy Tempeh, meu Stewed Patty Pan Squash, e meu Scallion Corn Cakes with Black-Eyed Pea Salsa.